Mandy and I always make the effort to get away on our Birthday weekend which fall in February and November respectively. This used to be in the form of a B&B, or hotel in a nice location away from home. However, since we brought the camper its pretty much been an excuse to go away in the van. Come mid October we were struggling to decide on a location for my birthday. 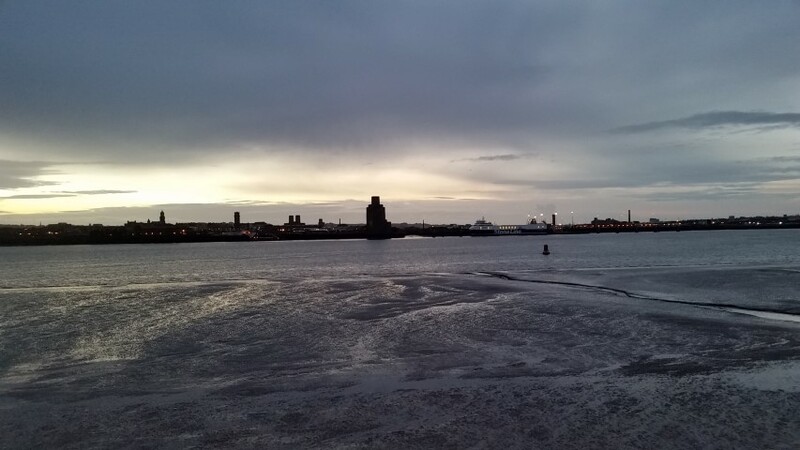 I saw a post on Facebook by somebody saying they had spent a night at Liverpool Marina in their camper, so we decided to investigated the option by looking at the Marina website ,and sending an email for prices and availability. The response was £15 per overnight stay in the outer car parks, which included access to shower facilities. The price was fine as a room in a hotel or B&B in the center of Liverpool would have been upwards or £80. However, information on the camping location was sketchy, so Mandy and I were understandably apprehensive. We decided to commit to the weekend in the hope that it would work out for the ok. Nothing ventured, nothing gained. Saturday 12th started well for me. I got presents and cards 🙂 . The weather on the other hand was dull and rainy 🙁 . We set off from Derby mid morning, and arrived at Liverpool just as the rain stopped and the sun came out. The post code we used in the Sat-Nav positioned us in a car park with a few campervans. Initially we thought it was the right location and were a little dissapointed at the lack of boats. There was water, but no boats. It soon became apparent we were in the wrong place as the Marina Yacht Club was nowhere to be seen. A short drive lead us to the right location where we found a nice spot on the edge of the car park to set the van up. This gave us great views of the boats in the Marina. We popped into the Yatch Club to make our presence known, collected a swipe card to enable access the shower (£10 deposit), and paid for two nights parking (£30). We soon got our bearings and headed towards Albert Dock. This was a 15 minute walk along the River Mersey past the Liverpool Exhibition Center, BT Convention Center and the Echo Arena. We had been to Liverpool in the past. The first time was a coach trip to the cavern club for an evening, and a couple of times after that where we parked up at the main shopping complex ‘Liverpool One’. 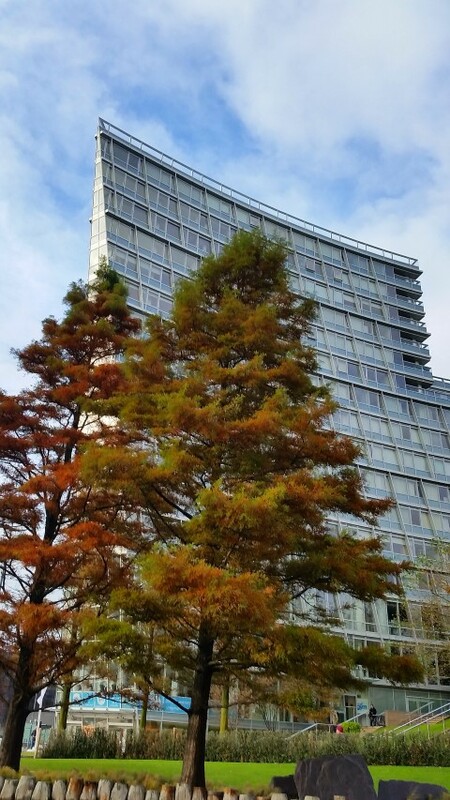 On all occasions we only saw a very limited portion of what the city had to offer. It’s not surprising that our impression of Liverpool was a little muted. That said, the regeneration and new developments seen on the brief walk from Marina to the Albert Docks was certainly giving me a reason to question my opinion. Over the course of the afternoon, my view of Liverpool changed dramatically for the better. The quays, wharf’s, docks, architecture, museums and colorful history makes Liverpool one of the most interesting City’s to visit. I really couldn’t believe that we had missed such a lot previously. Saturday afternoon gave us a great overview of the docks and its location in relation to the other areas we were more familiar with. A coffee at Nero, a meal at one of our favorite restaurants Zizzis, in combination with plenty of fresh air and walking made the day pretty much perfect. Suffice to say we both slept extremely well that night. On the Saturday I had seen some small ferries giving guided tours of the docklands and river. I decided that this would be a great way to pass some time and learn a little about the history of the area. Unfortunately no ferries were running on Sunday because of armistice day. So we settled for an open top bus tour. The temperature in the afternoon dropped so this was a chilly experience, but it was a great way to see far more of the sights than we would have been able to on foot. One fact I learnt was “Liverpool has more grade 1 & 2 listed buildings outside of London than anywhere else in England” . Blackpool Sands was the venue for the last stop of our two week vacation. 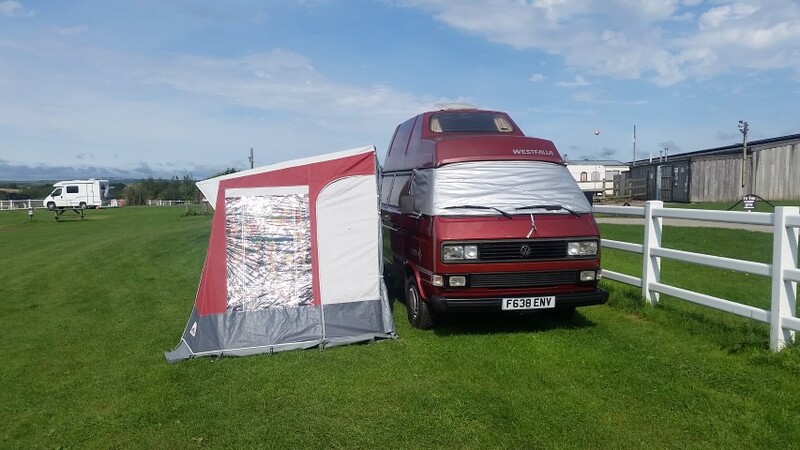 This was to attend the “2016 Vans in the Sands” camper van meet. This is a unique opportunity to camp on one of the best kept beaches in the country. It turned out to be a cracking event, and the Grand-Finale by all accounts. We arrived at Bay View Farm late afternoon after time in Fowey and Polperro . The last couple of miles off the main road were challenging. Very narrow and parts of the road had large pot holes and other areas were eroded quite badly as we approached the farm. I think the campsite had been told to restrict the sizes of vehicles that can stay on the site to reduce further damage to the roads. However, the views were worth it once we arrived. It was still chilly and overcast which turned out to be the theme of the day. 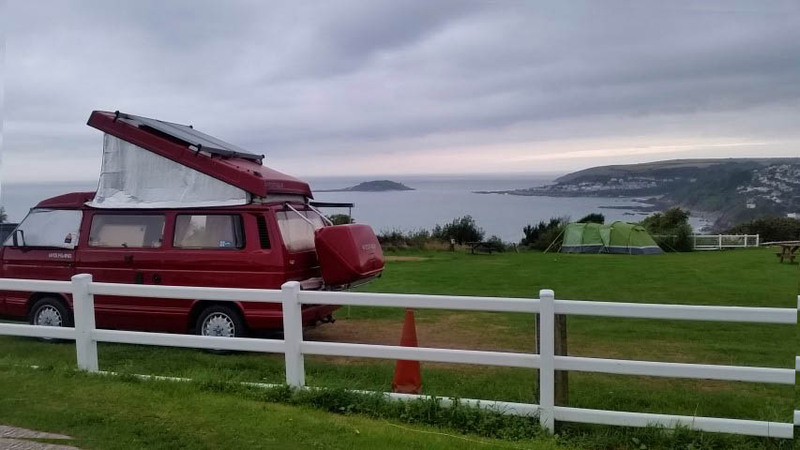 “At Bay View Farm Camping Site we offer you a warm welcome to our Cornish coastal farm, with its wonderful sea views overlooking Looe and St George’s Island. 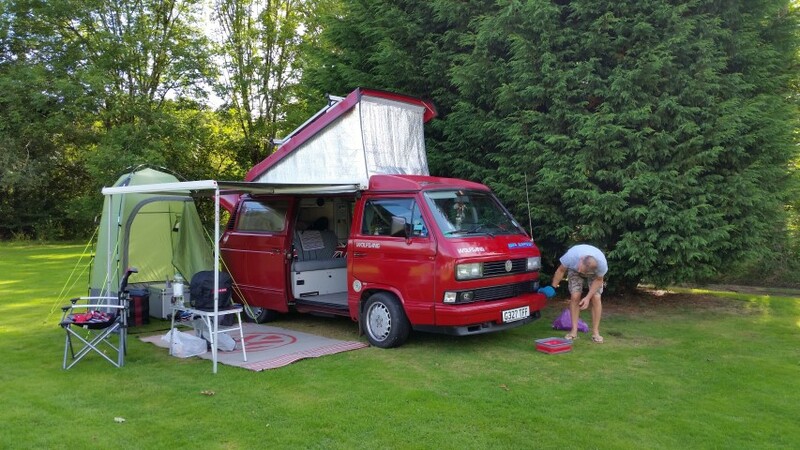 W e were pleasantly surprised to find two other similar campervans to ours on the site. 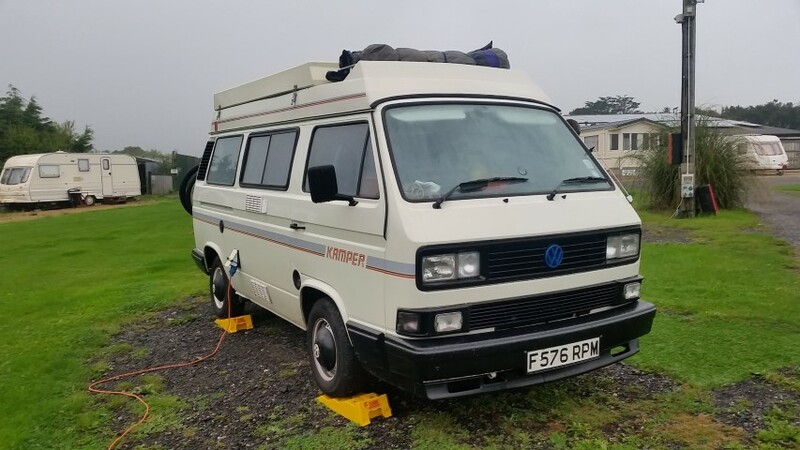 One an Autohomes conversion, and another Westfalia. We spent time chatting to both owners who turned out to be really nice. As the sun went day faded into night we admired the view. The following day started dull, wet and rainy. We thought that we were going to be affected by a weather front that meant that these conditions were going to continue for the rest of the day. So we decided that today would be a chance to unwind and have a day in the van with a book / radio / TV. Surprisingly the weather cleared and the day turned out to be great. We still chilled but it was nice to be able to sunbath and admire the vista. We felt really relaxed after chilling out. The following day was the day we were going to take a closer look at Looe. So far we had only admired it from a distance. That day turned out to be spectacular. We couldn’t have wished for the weather to have been any better! The next stop was going to be St Johns, near Torpoint, Plymouth. We knew that my Uncle wouldn’t be available to greet us until teatime, so the last hour or so we chilled out in the car park by the tidal river before setting off to visit my Uncle. We awoke in the morning at Little Winnick Touring Park to damp and drizzly conditions. We chose not to stay another night at the camp site, but hadn’t found another pitch for later on in the day. We knew the general direction in which we were needing to travel so we had options, but nothing we had committed to yet. We had heard that the Mevegissey to Fowey Ferry was one of the best boat trips in the UK. Mevegissey was literally two miles round the corner from Little Winnick so we considered this as our main excursion of the day. However, after checking on the website we found that due to unsettled conditions in St Austell Bay, all trips had been cancelled 🙁 . Plan B was to drive to Fowey and see what that had to offer. The day remained gloomy throughout, but it didn’t damp our spirits. We were content to be moving on after a couple of nights in one spot. 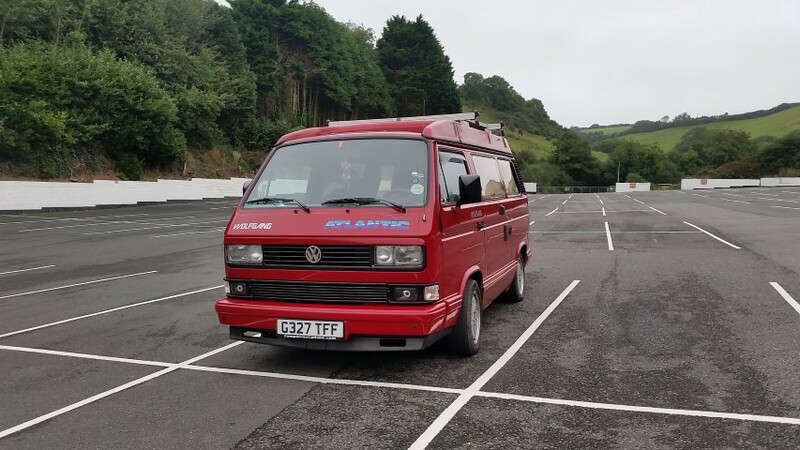 It only took us about 35 – 40 mins from Little Winnick but climbing the hill to the main car park required us to take a second run up after a car pulled out of a junction at the bottom of the hill killing Wolfgang’s momentum. Quite embarrassing really, but we made it in the end 🙁 . Fowey is quaint there is no doubt about that. Its twisting streets and alleys give it real character, and there are a raft of small shops and galleries to peruse. I would imagine that had the weather been good we could have gone on a harbor trip, or just sit and admire the boats. We spent an hour and a half looking round and getting our bearings before we decided it was coffee time. We found a nice Pub called the Gallion Inn. The view over the harbor was good so we chilled with a drink and took advantage of the free Wifi to look for a suitable campsite for the evening. An hour later we had polished off our drinks, had a meal and made a phone call to book in to our next campsite. It was still only early afternoon so the day was not over yet..
We walked up to the van and waved goodbye to Fowey. The next campsite was in Looe so we plotted a course to included Polperro. We weren’t sure how much time we would have there, but it was good to have the flexibility of pulling in another Cornish fishing village, even if it was on a whistle stop tour. We were there within the hour, and parked the van in the main ‘tourist’ car park at the bottom of the hill on the way into the village. Polperro is just a few miles from Looe, and is sheltered from the ravages of time in its cliff ravine. There was a tourist element about the place with the odd tacky gift shop, but that was limited and not overwhelming. I would say that Polperro had a similar genre of shops to Fowey. Some designer shops and art galleries. In total we probably spent about two hours there. Just enough time to walk around the shops and have an ice cream. In summary both Fowey and Polperro are amazing places and well worth a visit if you find yourself in this beautiful part of the UK. For us the lack of time in both places left us with enough reason to want to go back again in the future. Hopefully we will have some sun then, but for now we needed to get to our next campsite. Bay View Farm! After a great day in Falmouth we headed to Little Winnick Touring Park. This evening was meant to be a wild camp but we decided we couldn’t be bothered with the potential hassle of being moved on…and we liked the idea of having a shower in the morning 🙂 . We had already booked for two nights. However, arriving early we didn’t want to commit ourselves for a full three night, and the campsite was fine about us being indecisive. So we paid for two nights with the option of extending it further if required. To settle the meal we took a stroll a short distance along the main road and over a bridge onto the opposite side of the stream. The stream formed the boundary of the campsite. This path was a part of the Pentewan Trail which lead through a forest to the coast. After 20 minutes we headed back as it was starting to get dark. No great shakes as we ended up walking to the coast the following morning after breakfast and a shower. One thing we noticed about the campsite was the very limited mobile phone connection. That twinned with the fact we couldn’t do a great deal in the immediate location without having to pack the van up and use it to get around meant that it was a little restrictive. I guess we had been lucky at the previous locations we had visited and now we felt a little hard done to 🙁 . 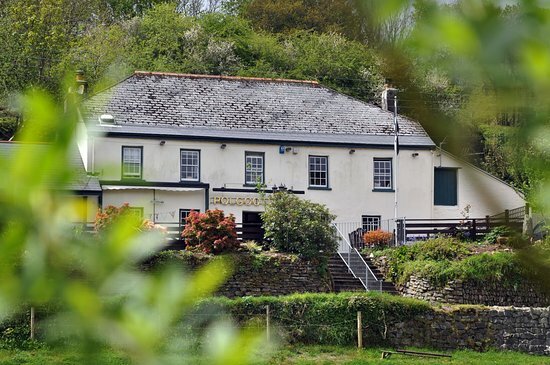 The second evening we drove to a pub called the Polgooth Inn about 3 miles from our touring park, but it was very popular and there was more than an hours wait for a table. 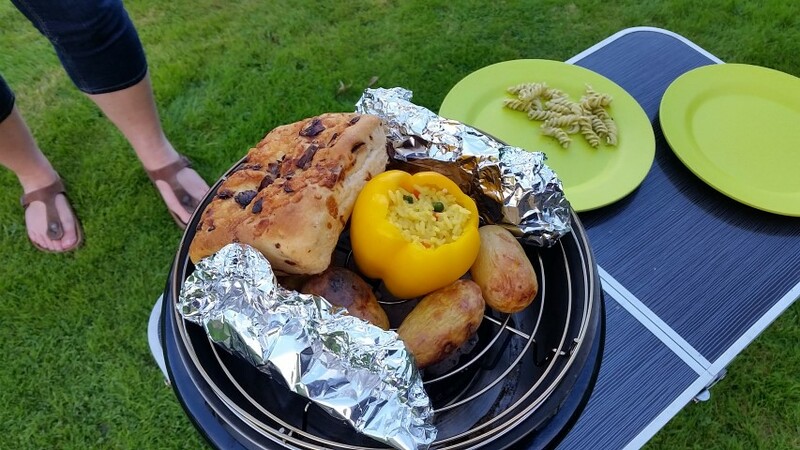 So we headed back after a drink and got the Cobb Cooker on the go. Suffice to say we decided not to stay for a third night.